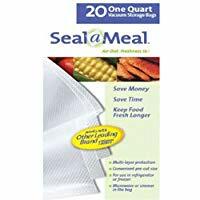 The Seal-A-Meal Vacuum Sealer is a budget priced vacuum sealer that we only recommend for people who need a vacuum sealer very infrequently and have a limited budget. 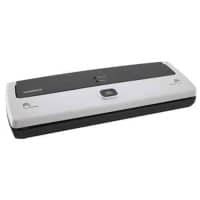 We feel the NutriChef PKVS18SL is much better choice and value for your money. Seals dry foods or frozen liquids. No on board bag roll storage. $35.66 Current Price - YOU SAVE 29%. 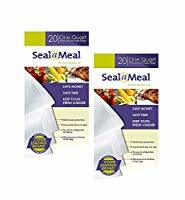 The Seal-A-Meal Vacuum Sealer is the lowest priced vacuum sealer we reviewed, we only recommend it for people who want a vacuum sealer but aren't going to use it that frequently. This model works with wet and dry foods and has a removable drip tray, which is something you usually only find in much higher priced FoodSaver Vacuum Sealers. You place the bag on the sealing bar and close the lid until you hear a click which starts the vacuum sealing process. There are no settings, which makes this model extremely easy to use. At 16" x 6" x 8" this model is very compact making it extremely easy to store. Be sure to read the negative aspects of this model before deciding to purchase this model. There are a lot of negative aspects about this model you should be aware of, first and foremost is the feel and quality of this model doesn't give us a lot of confidence, it does have a 1 year warranty, something to be aware of. There's no on-board bag roll storage, no food selector modes, no pulse mode, and no accessory port of hose. 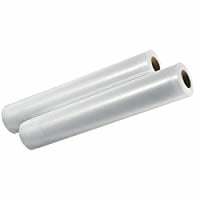 Basically, it seals and vacuum seals bags, that's it. If you have a little wiggle room in your budget we recommend the NutriChef PKVS18SL for $59.99 it's a lot higher quality and offers a lot of the features this model is missing. Comes with starter kit which includes: (4) bags. Automatically starts when cover is locked into place. 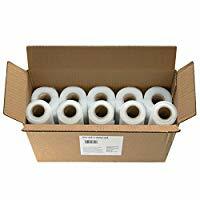 16" x 6" x 8" 6" x 14" x 3" 10" x 18" x 10"
$8.59 - $0.72 Per Sq. Ft.
$55.99 - $0.41 Per Sq. Ft.